At studioPQ, Patrick helps organizations experiment with and adopt collaborative approaches to designing service experiences and the operations that support them. He has held multiple design leadership positions, including Managing Director at Adaptive Path and Head of Service Design at Capital One. 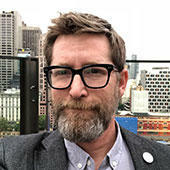 Patrick is also a passionate design instructor and has taught thousands of UX professionals in North America and Europe. He holds an MS in Information Design and Technology from the Georgia Institute of Technology. Patrick is coauthor of the Rosenfeld Media book Orchestrating Experiences. Connect with Patrick on LinkedIn.